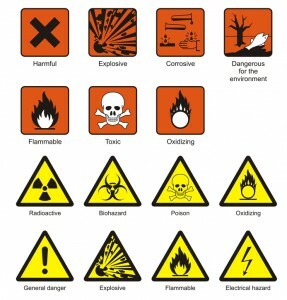 As part of OSHA’s new Final Rule, employers must adopt and use nine specific pictograms for the chemicals that they make, buy, sell or import. Continuing from OSHA’s New Final Rule: Hazard Communications in the Workplace (Part 2), this is the final installment of the three-part blog regarding new OSHA regulations associated with chemical hazards in the workplace. While Parts 1 and 2 of this blog focused on the consistent chemical labeling system and the changes to Hazard Communications Standards, respectively, here in Part 3, we will take a closer look at the nine new pictograms for chemical hazards that OSHA has adopted. It’s important to note that employers will be required to start using these pictograms for chemicals that they use, make, buy, sell or import by December 1, 2013 in order to be in full compliance with OSHA. A silhouette of a person’s upper body with an asterisk on the chest – This pictogram is intended to warn employees of the chemical’s risk of causing various health problems, such as cancer, breathing problems and/or organ problems. A skull and crossbones – This image warns that a chemical is acutely toxic and can potentially cause fatal complications. A flame – This pictogram warns about a chemical’s risk of being flammable, highly reactive or emitting a flammable gas. A flame over a circle – This image warns that the chemical is an oxidizer. An exploding bomb – This image warns that a chemical is particularly reactive or explosive. An exclamation mark – This pictogram warns that a chemical can be particularly irritating to the sense and may have an intoxicating effect. Two test tubes with one spilling on a hand – This image warns that the chemical is corrosive to the skin and/or metals. A gas cylinder – This image warns that the chemical includes pressured gases.